Today would have been a great day in my life if it was twelve years earlier, or if I were twelve years younger. 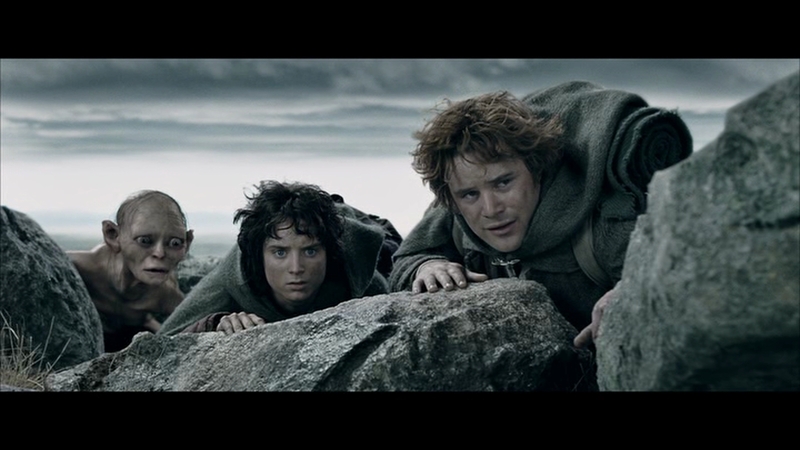 I had the privilege of being in college when the original Lord of the Rings movies were released. Fellowship was released in December of 2001, when I was a sophomore. The Two Towers arrived my junior year, and The Return of the King during my senior year. And it was a big deal, let me tell you. Back then, at college, the movies were big events. I’d guess that on the night each one was released, about two thirds of the student body showed up at the nearest theater for the midnight screening. It was the social event of the season. Why? Can’t really say. When I was nineteen or twenty years old, there was something immeasurably cool about watching vast armies chopping each other to pieces. The fact that the armies were entirely digital, with no physical existence to speak, did not reduce the coolness of it. It was cool. It was awesome. It was amazing. Thirteen years later, it’s no longer cool or awesome or amazing to me. I would venture to say that if someone rounded up those hundreds of Harvey Mudd students who sat is lines outside the theater for six hours in December of 2002, most of the them would express similar feelings. Hence I’ve not bothered to see any of the Hobbit movies. Why is a particular movie–or anything, for that matter–cool at one stage of life and uninspiring at a later stage? I don’t know. Somebody should investigate that question. Day 18: A book that disappointed you. As I already explained on day 11, I’ve encountered a lot of books that I don’t like. This category is somewhat different. I need to come up with a book that I started with full expectations of liking, but ended up not liking. Almost anyone from my generation has seen the movie and can quote from it liberally (and frequently does), but few have read the book. I saw the movie multiple times in high school and college. It is an excellent movie, witty and fast-paced and with a simple, workmanlike visual feel that’s so much better than today’s special effects extravaganzas. Having seen it, and knowing that William Goldman was the screenwriter for the movie, I figured there was no way the book could go wrong. Well, it does go wrong, because while the movie focuses on the story, Goldman instead tries to get clever and post-modernist with the book. Rather than just writing a straightforward narrative, he instead presents it as an abridgement of the great Florin classes by S. Morgenstern; Goldman has supposedly removed the boring socio-political commentary and given us “the good parts”. In reality both the nation of Florin and Mr. Morgenstern do not exist. They are simply part of a silly device by which Goldman introduces the story and then interrupts it from time to tell us which parts were left out of the non-existent original. It’s a device that aims to be clever, but it ends up being merely annoying. Which is a shame, because some parts of the book are quite good, and even add on things that aren’t in the movie. We get more background on Fezzik and we learn the sequence of events which launched Inigo Montaya on his famous quest for revenge. We get additional acts of desperate heroism from both those characters in the Zoo of Death, a location shamefully left out of the movie. We get a lot more as well, but overall I simply can’t give the book a thumbs up. This post is following up on my previous post discussing the social ramifications of Transformers: Dark of the Moon and other films of that ilk. As you may recall, I was not too happy about them, nor was I optimistic about their effects on our children. The lesson of these movies, such as their is one, seems to be mainly that it’s fun to watch people get killed and property destroyed. In addition one could glean a number of secondary lessons, such as that the proper role of women is to be helpless and useless beyond wearing as little as possible. It’s worthy to ask where such movies came from. As I said, they have always been with us to some extent, but they’re with us now to a much greater extent. 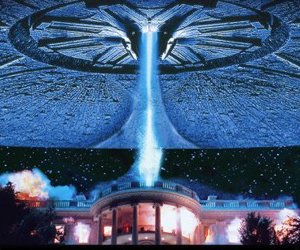 A foundational moment in the evolution of the crap movie would be a title that it’s quite appropriate to discuss on this particular date: Independence Day. This, for anyone who’s forgotten or was lucky enough not to learn in the first place, was the 1996 blockbuster about alien invasions. It might be considered the ultimate summer movie, if summer movies are those producing ungrammatical comments such as “I like watching stuff blow up real good.” There are more and bigger explosions in Independence Day than in any other movie I know. Beyond the massive fireballs that took several minutes to roll over Washington D.C., New York City, and Los Angeles, the other notable thing about Independence Day was the shameless stereotyping used in the cast. The message is clear. It’s nice to have a character like Jeff Goldblum who can encounter an alien spacecraft and program a virus to take down the entire alien fleet with ten minutes, but you wouldn’t actually want to be him. He’s too geeky, too socially inept, and too Jewish. Clearly the character you want to be is Will Smith, who punches aliens directly, chomps on cigars, survives any number of recklessly stupid decisions, and uses as much profanity as can be squeezed in under the PG-13 label. However, there is an obvious difference between Transformers and Independence Day on the one hand and This Island Earth and Earth versus the Flying Saucers on the other. It’s a difference so obvious that most of us won’t think about it unless someone points it out. Current movies have good special effects while movies of the 50’s had lousy special effects. It’s obvious that Earth versus the Flying Saucers is showing you wooden saucers slicing into cardboard buildings. The space scenes in This Island Earth would barely cut the mustard in Loony Tunes. By contrast, Transformers has achieved photo-level realism, or at least what realism would look like if giant robots disguised as common household objects ever infiltrated Chicago. Because of the better technology, today’s blockbusters can occupy a bigger ‘space’ in our imaginations than yesteryear’s. A typical movie-goer today will spend more time mentally reliving the scenes from big movies because those movies are, at least in the visual sense, much more worth reliving. While the cheeseball epics of the 50’s could serve as a spur to someone’s imagination, today’s movies instead become replacements for imagination. The visuals are so powerful that they take over the mind for long periods of time. That’s why there’s more reason to be concerned about modern movies and the effects that they have on us. Thus far I’ve commented only on movies that I won’t see on this blog. I’m not going to break the pattern now. In fact I haven’t gone to a theater for a new movie yet this year, though I’ve seen a few classics, so there’s a good supply a movies that I haven’t seen. Transformers: Dark of the Moon is only the latest one. My reasons for not seeing it could be summed up in Roger Ebert’s Review. The series exists to show gigantic and hideous robots hammering one another. So it does. The last hour involves a battle for the universe which for some reason is held at the corner of Michigan Avenue and Wacker Drive in Chicago. This battle is protracted mercilessly beyond all reason, at an ear-shattering sound level, with incomprehensible Autobots and Decepticons sliced up into spurts of action with no sense of the space they occupy. Walter Chaw’s review covers much the same ground, but with more vehemence. Or maybe it’s the extended profanity, the wholesale and semi-graphic murder of innocents by both sides, the way the robots bleed in crimson arterial sprays in this PG-13 movie, that instigates the realization that Transformers: Dark of the Moon is a new low watermark for Bay and this naughty-little-boy franchise that highlights Bay’s misogyny, puerility, and imbecility for all the world to see. I’m content to accept their word that Transformers: Dark of the Moon is a dumb, vulgar, and nasty movie, and thus I will not see it, nor say any more about its aesthetic qualities. I will say that I’m concerned about the fact that so many people, particularly young people, are watching this sort of thing. Now, if anyone on the internet expresses that sort of concern in a public forum, they usually get buried by a stream of two main responses. 1) The ‘it’s supposed to be be dumb’ response. Hey, look buddy, what were you expecting–Citizen Kane? It’s only supposed to be stupid summer fun! So just turn off your brain and enjoy it for what it is. 2) The ‘same as always’ response. So Hollywood is releasing big-budget, stupid, exploitative, violent movies? What else is new? They’ve always done that! We survived the gangster shoot-em-ups of the 30’s and we’ll survive this stuff too. Both responses irritate me because they are ways of ducking the argument, rather than confronting it intellectually. The first response presupposes that there’s a clear split between entertainment and serious movies, as well as other types of art. It assumes that whatever is on the entertainment side cannot have any serious affect on a person. But this is not true, not for anyone and certainly not for children. Anyone who’s ever had a child or been a child should know that their entertainment affects them, that they imitate what they see on the screen, absorb what they see on the screen, incorporate what they see on the screen into their mindset. Wise people have been aware of the importance of entertainment since long before cinema was invented. As for the ‘same as always’ response, it simply isn’t true. Sure, Hollywood has produced a lot of dumb, violent movies since its inception and other media have been dumb and violent since long before that; even Shakespeare wrote Titus Andronicus, after all. But stupidity exists on a spectrum and today’s stupid spectacles may be more problematic than yesterday’s. I honestly feel that Hollywood has been plumbing new lows this year. The trailer for Your Highness exists only to inform us that this movie had many women wearing thongs, and they’re somewhat more revealing than ordinary thongs; I did not appreciate having this pop up every time I logged on to YouTube for a stretch of several weeks. Sucker Punch was another one that had aggressive, exploitative ad campaign. If these movies and others like them represent what a typical audience member wants, there is reason to be worried.